Family farm: Blake Campbell and his older brother, Brady, are fourth generation farmers at Campbell Farms, in Waterford. They farm sheep and hogs with their parents, Joe and Bridget, and their grandfather, Charles. 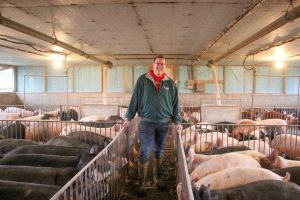 Blake Campbell found his passion in the heritage breeds when he and his brother wrote essays for an Ohio Berkshire Association contest and won two gilts each. At just 8 years old, he and his brother formed Campbell Brothers II. Currently Campbell has around 125 purebred sows in the Berkshire, Tamworth, Spotted and Poland China breeds. Campbell, his dad, and grandpa raise their hogs together and can have around 1,000 head on hand. “We can provide all stages of the pig, from weaned, to feeder to finished,” said Campbell. Campbell has around 60 head of purebred Texels and crossbreed sheep on his family farm in Washington County, Ohio. 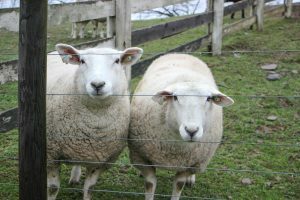 The Texel breed is a meat breed and not a commonly raised in Ohio, but Campbell hopes to change that. Campbell also has around 60 head of purebred Texels and crossbreed sheep. His father raises Lincolns, and his grandfather has around 125 head of his own sheep. The Texel breed is not a common breed in Ohio, but Campbell hopes to spread awareness of the breed. Texels are a short and stocky meat bread, desired for their muscle development and leanness. This past year, the Campbells won reserve grand champion, all other breeds, meat ewe with their Texel breed at the Ohio State Fair. In early January, the Campbells finished construction on a new nursery for their weaned hogs. It can hold up to 150 piglets and Campbell said they were able to insulate the barn with wool from the family’s flock of Lincolns. The nursery gives the Campbells a place to give the piglets a little extra attention before moving them to the group housing unit with the older pigs. Between the Campbell brothers, their father, and grandfather, their can be around 1,000 head of hogs on hand at all time at the Campbell Family Farm. 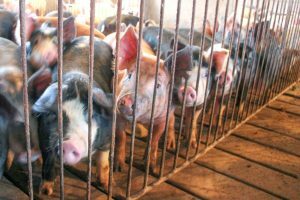 “We can provide all stages of the pig, from weaned, to feeder to finished,” said Campbell. The Campbells sell most of their hogs off the farm by word of mouth. Many 4-H youth in West Virginia purchase hogs from the Campbells as fair projects. Campbell said they have found the sheep market to be a bit more challenging. They have been able to sell a few market and breeding stock by word of mouth, but most of their sales are through the Mount Hope Auction in Mount Hope, Ohio. Campbell attended Waterford High School where he served as president of the Waterford FFA during his junior and senior years and served as a the District 10 vice president his junior year. 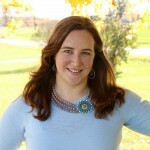 Campbell also served as the 2013-2014 Ohio FFA District 10 President. Campbell said the ability to represent his small chapter on the state and national level is an experience he holds most valuable. National FFA Week is Feb. 18-25, 2017, to see what chapters in your area are doing to celebrate visit Farm and Dairy’s interactive map. Campbell has won his share of FFA proficiency awards including the Ohio and national swine divisions, was a national finalist in sheep, won the state accounting proficiency and was the 2016 Ohio candidate for the Star American in Agribusiness. Campbell has also participated in various career development contests, including parliamentary procedure, public speaking and soil judging and traveled to the Eastern States Exposition where he was named the 2014 Eastern States Exposition Star State Farmer. The Eastern States Exposition, or Big E, is billed as New England’s Great State Fair and includes six New England states — Connecticut, Maine, Massachusetts, New Hampshire, Rhode Island and Vermont. Campbell hopes to teach agriculture education in southeastern Ohio, close to where he grew up, so that he can continue to farm with his family. Campbell said his FFA background, as well as his passion for agriculture, played a role in inspiring him to pursue this career. “If it was not for being so involved (in FFA) and being pushed to my fullest ability by my ag teacher (Matt Hartline), I would not be where I am today,” he said. “My ag teacher has had a huge impact on my life. 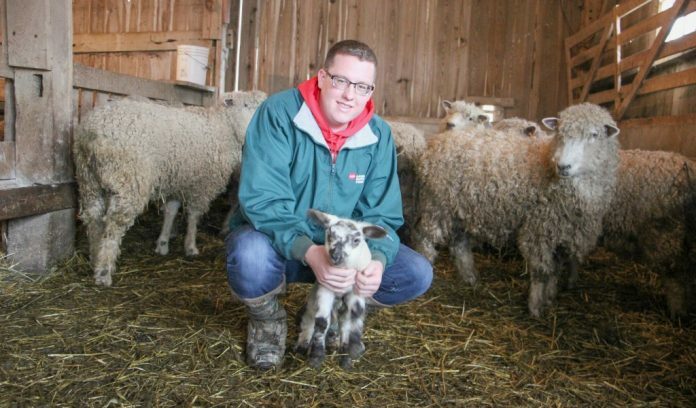 I hope that one day I can be there for future students who want to succeed.” Campbell hopes to continue farming on the side at his family’s farm if he is able to find a teaching job close to home. Great to read inspiring comments by a motivated youth supporting agriculture industry. 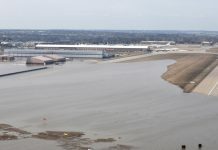 With his background rooted in agriculture, he has a head start to motivate being a tremendous spokesman for agriculture. I’ve meet hundreds of Nebraska FFAers who are really shape-minded not afraid to challenge themselves on diverse issues facing agriculture industry.